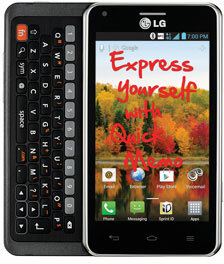 The LG Mach is an LTE smartphone with NFC and a sliding Qwerty keyboard. The device features a 1.2GHz dual core processor and a 4-inch 480 by 800 pixel display. LG’s Optimus 3.0 user interface is layered on top of Android 4.0 ‘Ice Cream Sandwich’. The handset, then known as the LS860 Cayenne, was first rumoured in May 2012 and then spotted in an FCC filing in September. The LG Mach is available on Sprint’s 4G LTE network in the US.